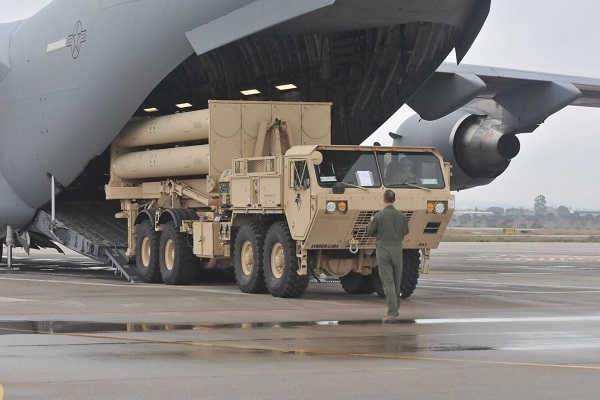 These days, the American THAAD (Terminal High Altitude Area Defense) missile defense system – the US equivalent of the IAF "Arrow" – is being deployed in Israel by the USEUCOM (United States European Command), according to the United States Secretary of Defense's instructions. This marks the first arrival of a battery of this sort to Israel and the Middle East, and its deployment is a part of a process meant to make the battery operational in Israel. "The deployment is meant to improve our readiness for the day when we are called to operate together in combat", explained Brig. Gen. Ran Kochav, Commander of the IAF Air Defense Division. The American battery – reminiscent in its capabilities of the "Arrow 2" weapon system, and considered one of the most advanced of its kind – is an anti-ballistic missile defense system. "The American battery brings additional capabilities and increases the scope of our interception abilities", emphasized Brig. Gen. Kochav. "We decide which system we utilize for interception according to the threat at hand. Additional weapon systems open up our range of options". The American weapon system will operate in synchronization with the Israeli systems deployed across Israel. It joins the IAF's air defense capabilities in operating against long-range ballistic missiles. "We have a mutual operation network. Everybody works according to one Israeli-American protocol and we all share an aerial overview", explained Brig. Gen. Kochav. "However, it's important to note that it's the Israeli forces who are in control of the interceptions. Our state is sovereign and so we are responsible for protecting its skies – the Americans provide us with a helping hand". The deployment is of strategic, operational and professional importance. "We need to make the most of the Americans' time in Israel and utilize it for mutual learning, cooperative training and improvement of our fitness", said Brig. Gen. Kochav. "Anyone who's involved in the mission is deeply invested, seeing as they realize the importance of an optimal, professional integration and a tight cooperation". The deployment is part of a long sequence of cooperative exercises and scenarios performed by the IAF and the US Forces. Just several weeks ago, the "Juniper Falcon" exercise – the largest IDF/US Military directorate exercise to date – was held. The exercise saw IAF Air Defense Division combatants operate alongside forces from the USEUCOM (United States European Command) and drill the arrival of the forces to Israel. The latest exercise as well as the current deployment both emphasize the continuous strategic cooperation between the countries.